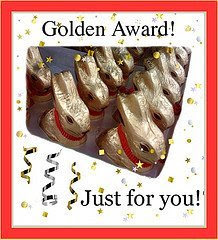 We won the Golden Award from Monty at Millie's House. How beautiful is this!!! First, we would like to give it to Ginger Jasper - we love this pretty kitty very much. 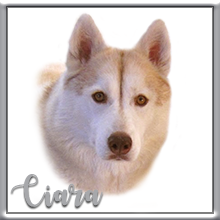 And then we are going to send it to Kat and Steve and Kira and the other Khyra for being our good furiends and for always trying to protect our world from the evil critters, like squirrels and raccoons and bunnies. We are so excited because we have also been nominated by Travis for the Supa Saturday Award. 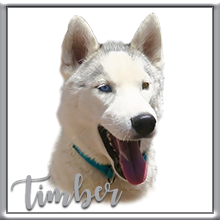 If woo would like to vote in this contest, please visit him and consider a vote for the OP Pack. Woo can vote in his sidebar at the top of the blog. 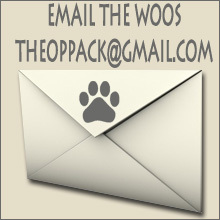 If woo decide to give a paws up for the OP Pack, thank woo furry much in advance. If woo don't, that's OK too, we will still love woo. 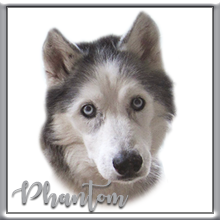 We would like to close today by letting our Princess Dakota have a chance to show woo that she still does love to go for a walk. Hope woo enjoy our St. Paddy's Day walk. By the way, those were a bunch of tasty dried worms that we were all munching on at the edge of the garage door. Mmmmm mmmmmm good!!! 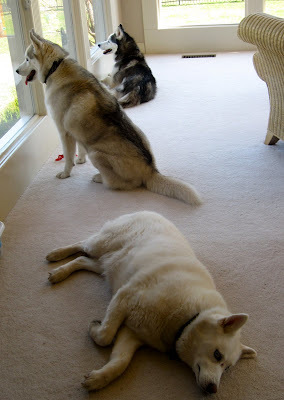 And here's what we all did after our walks. 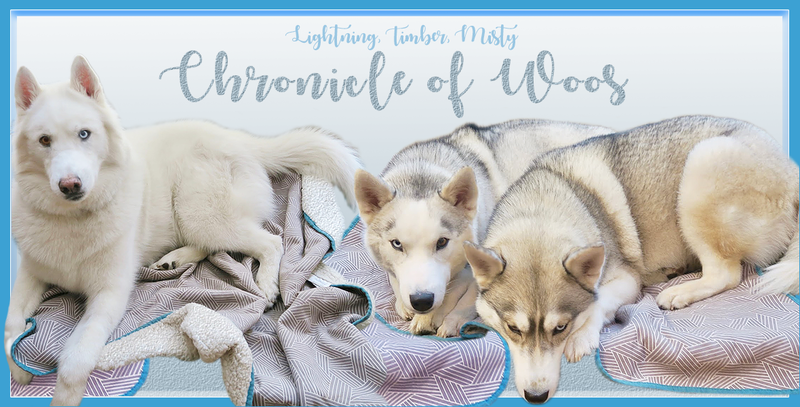 That's all the "woos" for today. Oh thank you so much for the award. Mum is going away untill Friday and promises to put it up for me as soon as she comes back. You are so kind. 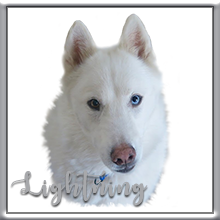 Dakota - So awesome to see you out for a walk in that sunny weather. We are rooting for you everyday. As for the comment about The Herd walking well, let's just say we edit well (grin). The Herd certainly has their moments on lease. Congrats and thanks for the award!We voted for you over at Travis's too! 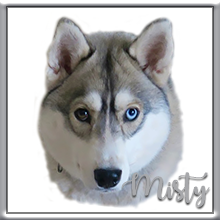 Fun walkie, and no you do not talk tot fast, or at least you don't for me, people are always telling Mommy she does too, so I am used to it! ...of khourse I khaught Phantom's fine tail akhtion! That was a furry nice walkin' Wednesday on St. Patrikhk's Day Tuesday! I know your mom has to do things fast - she doesn't have enough hours in her day to get evfurrything done! You are so lucky to have such great windows to look out of and keep watch! LUCKY! That was a great walking video. 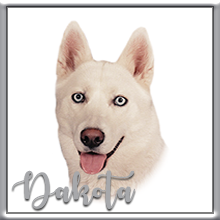 We are glad to see Dakota up for the walk. Even though she may be moving a little slower, Princess Dakota always captures our attention. Congrats on your award! Very good to see all three out and I liked the fluffy tail too. Do you guys do that right after your walk, or do you do zoomies first? We're so glad Dakota was feeling up to a walk today! That's always a good thing. Congrats on the award and we're trotting right over to vote for woo! Momma says thanks for talking slower so she could listen slower. Her brain doesn't work so good. I am impressed by the sight of the three of you. You are such good doggies to be able to walk together like that. We have fruit trees too. Its fun to eat right off of them. 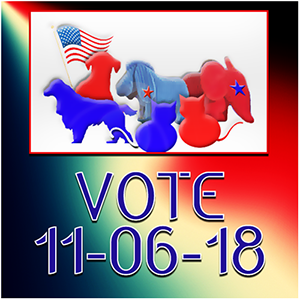 I just voted for you and you're winning! I like to sleep a lot, like Dakota. Maybe she's part cat too. You all sure look handsome/beautiful looking out the window and resting..
We shall check by that blog and vote for you too. 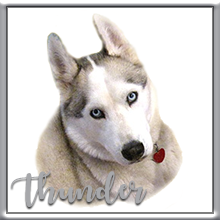 We have just been catching up with your blog and saw those beautiful photo's of Princess Dakota. They were all lovely, she is so photogenic. Congrats on your award! I also voted for you! It was great to see Dakota on the walk! Looks like a fun walk....good job Dakota! Congrats to all of you on the award! You had a very nice walkie! Yum, dried worms! Our mom eats fast too and talks fast and when we pull her, she walks fast! So tell your mom not to feel bad. PS. Thanks for the award! !